Year 2014 in every way was a benchmark of Concepts and upgraded motors. In queue to same, the SR Performance team introduced one from the house of Audi. Model this time was Audi S3, which after getting a new upgrade kit got revealed as SR Performance Audi S3 Limo 2014. Let us have a look at the review of SR Performance Audi S3 Limo 2014 to know entire details about it. Upgrading and creating the final SR Performance Audi S3 Limo 2014 looks like a sequential task achieved through dedication and commendable planning by professionals. The sequence begins with KW coilover kit which adds a suspension strut bearing to front axle, as a result what you get is lowered ride height which moves over massive 8.5*20-inch forged wheels featuring 10-spoke V-esign. Adding star to its looks you get redesigned panorama roof, which comes wrapped in glittering black. 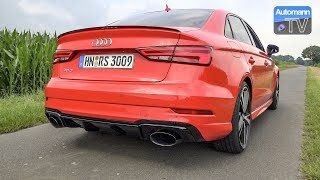 On technical ground the SR Performance Audi S3 Limo 2014 received certain changes like the MTM M-Cantronic performance boost accompanied with BN pipes-downpipe and last but not the least a 20-cell HJS catalyzer. These changes together work out and give the engine a heart-throbbing power to roll this gorgeous redesigned vehicle. After all the upgrades inculcated into SR Performance Audi S3 Limo 2014, through its 2.0 Liter four-cylinder turbo engine it produces total output of 380 hp and peak torque of 470 nm, vanishing the predecessor’s 300 hp and 380 nm. The power so generated takes the SR Performance Audi S3 Limo 2014 to 62 mph from standstill in just 4.6 seconds and thus proving the dedicated work to level it was planned.